JG 77 fought on almost every front from 1939 until the war’s end, which explains its high number of losses. From Poland, Norway, France, over England, to Russia and Africa as well as the Mediterranean. Uffz. 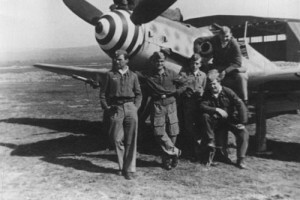 Hans-Bruno Maximow (3rd from left) was reported missing after a mission in the Nogent-Le-Rotrou (western France) area and a combat with P-51s on 6th July 1944. Here follows the list of MIA pilots of JG 77. Any question concerning this list is welcomed. If you have the answer to just one of these entries, I would be glad to include your remark and name. 12/09/41 Lt. Eckardt v. d. Lühe 3./JG 77 Bf 109 E-7 (1075) Yellow 10 Liza-Bay area, probably KIA in combat but no grave known. KIA in combat with Hurricanes of 81st Squadron, 10 km east of Liza-Bucht. Uffz. Linkmann, who was posted as MIA after an aerial enagement with American bombers on October 1, 1943 over Tuscany. The crash point of his « Gustav » has been located near Vecchiano ( Pisa ). Could you, please, confirm he is still considered as MIA? Thanks to Ago Alberti member of Air Crash Po ( www.aircrashpo.com ).